Agricultural output and productivity have changed dramatically in Central and Eastern European countries (CEECs) and the Former Soviet Union (FSU) since the fall of the Berlin Wall, exactly 20 years ago. Initially, market reforms caused a strong decline in agricultural output. The extent to which this output decline was associated with changes in productivity depended on the speed with which labor could exit agriculture and agricultural factor and output markets could develop. These, in turn, depended on the initial conditions and implemented reform policies. As the initial conditions and reform policies were very different across countries in the region, productivity evolved very differently across countries. In this paper we document the changes in agricultural output and productivity, explain how they were affected by a combination of factors, identify four “patterns” of productivity changes, and then relate these patterns to differences in initial conditions and reform policies. Our review covers more than 20 countries. To keep the discussion more tractable we organized countries into six regional groups. Specifically we distinguish Central Europe (Hungary, Poland, Czech Republic and Slovakia), Baltics (Estonia, Lithuania and Latvia), Balkans (Albania, Bulgaria, Romania, Slovenia), European CIS (Commonwealth of Independent States) (Russia, Ukraine, Belarus), Transcaucasia (Georgia, Armenia, Azerbaijan), and Central Asia (Uzbekistan, Turkmenistan, Kazakhstan, Kyrgyz Republic, and Tajikistan). Figure 1 shows the evolution of agricultural output in the past two decades. The pattern is similar in all countries. In general, we observe a U effect: an initial decline in agricultural output and a recovery later on. In the first years of transition, gross agricultural output decreased in all countries by at least 20%. The transition from a centrally planned economy to a market orientated economy coincided in all countries with subsidy cuts and price liberalization, which in general caused input prices to increase and output prices to decrease. Purchased inputs were no longer affordable at the new relative prices and the decrease in input use caused a decrease in agricultural output. In the Baltic states and the European CIS agricultural output decreased to about 50% to 60% of the prereform output. In Central Europe and Central Asia, output declined by 25% to 30%. Output stabilized and started to recover in the mid 1990s in Central Europe and later in the other regions. Currently agricultural output is close to the pre-reform output level in most countries. Figure 2 illustrates the evolution of agricultural labor productivity (ALP), measured as output per farm worker. Despite a decrease in agricultural output in total, output per worker in Central Europe strongly increased during the past two decades. This increase was driven by the dramatic decrease in agricultural employment in the first years of transition from centrally planned to more market-oriented economies. As output stabilized at the end of the 1990s and agricultural employment continued to decline, the increase in ALP continued. However, this pattern was not followed by other countries. In the Balkan countries the agricultural sector acted as a social buffer and absorbed rural labor in the first years of transition (Swinnen, Dries, and Macours, 2005). ALP decreased initially as much labor was absorbed in agriculture. In the late 1990s labor began to flow out from agriculture and this outflow of labor, in combination with increased investments in the farming and agri-food industry, resulted in a gradual but consistent improvement in ALP. Farther East, ALP strongly decreased in the first decade of transition. On average, ALP decreased by 33% in the European CIS and 30% in Central Asia in the first five years of transition. The strong decline in ALP was the result of two effects. First, agricultural output declined strongly in both regions and second, the outflow of agricultural labor was limited, and in some regions agricultural employment even increased. From the mid 1990s, however, the decline in ALP started to slow down and since the beginning of the 2000s ALP has recovered slowly. 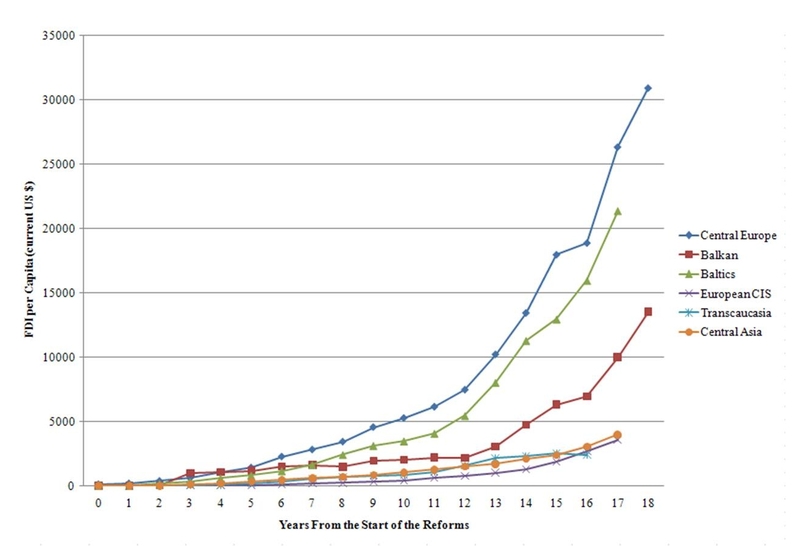 Figure 3 illustrates the time path of land productivity, which evolved in conjunction with ALP. Everywhere in the region average yields fell during the first years of transition and recovered later. However, the depth and length of the fall differed strongly among countries. Average yields recovered considerably from the mid 1990s onwards in countries such as Hungary, nations with relatively more large-scale farming and investments in the food industry. In contrast, productivity recovered more slowly in countries such as Romania, which has a large number of small-scale family farms with difficult access to inputs. Yields declined the most in the European CIS and Central Asia where yields started to increase only from the beginning of the 2000s. Importantly, the recovery of yields in the European CIS and Central Asia was so slow that they only recently reached their prereform levels. 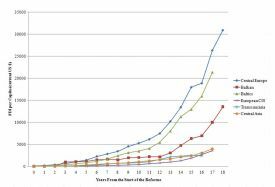 Of course, partial productivity measures might exhibit very different patterns than would be found using measures of total factor productivity (TFP), the most comprehensive measure of productivity. Unfortunately, only a few studies have measured total factor productivity (TFP), and consequently only limited comparisons can be made between countries and over time (Macours and Swinnen, 2000; Swinnen and Vranken, 2009; Lerman, Caski, and Feder, 2004). However, the available evidence on TFP is roughly consistent with the evidence from the partial productivity indicators. In Central Europe, TFP grew slightly in the first years of transition —0.4% annually between 1989 and 1992— and significantly afterwards: by 2.2% annually between 1992 and 1995 and by 4.4% annually between 1995 and 1998. Studies find a slowdown of TFP growth in the period 1998-2001, probably due to substantial investments in agricultural machinery and capital inputs in this period. In the Balkan countries, the TFP evolution fluctuates much more. TFP decreased strongly, by 4.1% per year, from 1989 to 1992. Later there was a stronger recovery when TFP increased by 7.5% per year in the period 1992-1995, but it fell again in the late 1990s with bad macro-economic policies resulting in TFP declines of 1.3% annually from 1995 to 1998. 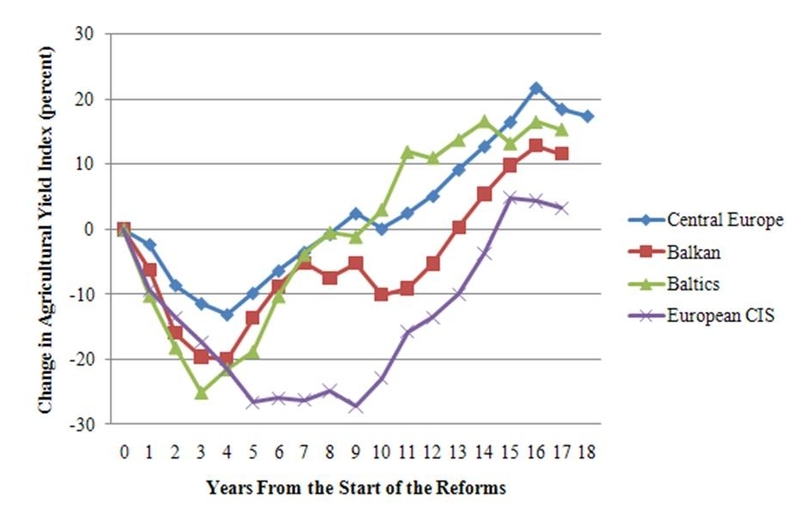 After 1998 when a series of important reforms were implemented in the region, there was a strong recovery in productivity: from 1998 to 2001, TFP grew on average by 2.3% per year. The productivity changes—and the variations in them—were caused by a combination of factors. In this section we review a few of the main drivers. First, initial conditions affected productivity in two important ways. On the one hand, they directly influenced the impact of reforms; on the other hand, through institutional and political constraints, they also indirectly influenced the choice of the reform policies. For example, the collectivization of agriculture and the introduction of central planning occurred in the 1920s in the FSU, but only after World War II in CEECs. Consequently, rural households in Central Europe had much more experience with private farming than their counterparts in most of the FSU. This difference affected not only the emergence and dynamics of the new private farms, but also the preferences for land reforms: in CEECs households wanted their land back, while in a large part of the FSU households had never owned land since feudalism had directly preceded collectivist farming. Another condition that played an important role was that in Central Europe and the Baltic states, countries were generally richer and agriculture was less important in the overall economy, compared to countries in Transcaucasia and Central Asia, which were much poorer with relatively more important agricultural sectors. The general economic situation in a country influenced the extent to which other sectors could absorb surplus labor from agriculture and the development of the social safety net system. Finally, the outflow of surplus agricultural labor was much stronger in Central Europe than in other countries in the 1990s, in part because the social safety net system was much better developed in Central Europe and the agricultural sector was relatively small. Initial conditions, in particular resource endowments and use of technology, also affected the relative efficiency of farm organizations and thus incentives for farm restructuring. Resource endowments affect the costs and benefits of shifting from corporate farms to family farms. If labor/land ratios are high, as in countries with labor-intensive technologies, such as in Transcaucasia and the Balkans, the benefits from better labor governance by shifting to family farms from corporate farms are larger, while the losses in scale economies of shifting to smaller farms are lower. These productivity incentives resulted in a strong shift to small scale farming. In contrast, in more capital- and land-intensive agricultural systems, such as in the Czech Republic and Slovakia, the benefits from shifting to family farms were lower so that large-scale corporate farming remained more important. In these situations, productivity gains came mostly from laying off corporate farm workers. Second, reform choices and their implementation also mattered importantly— and they differed by country. For example, price liberalization and the subsequent decline in terms of trade strongly affected agricultural productivity. The decrease in output prices and the increase in input prices caused a decline in the terms of trade. This contributed to a fall in input use at the start of the reforms, which caused a decrease in the productivity of land and labor (Macours and Swinnen, 2000). The implementation of these reforms differed substantially between regions. 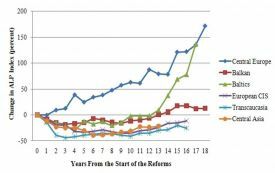 Governments in Central Europe and the Baltic states dramatically reduced agricultural subsidies in the first years of transition, whereas in some European CIS and countries in Central Asia, reforms were more gradually implemented (Csaki and Fock, 2001). A very important element of the reform packages was land reform. There were three types of land reform: restitution of land to the former owners; the physical distribution of land to agricultural workers; and the distribution of certificates to agricultural workers (Macours and Swinnen, 2002). The two first types of land reform, restitution and the physical distribution of land, ended up with relatively strong and well-defined property rights. While it was expected that restitution of land would lead to a decrease in productivity because of the fragmentation of land ownership, in many countries restitution contributed to a greater consolidation of land use because many of the former owners were not interested in farming themselves, and rented the land to the privatized cooperative and corporate farms. In the regions that implemented land reforms by distributing certificates, property rights were less-clearly defined and, at least in the first decade of the reforms, output and productivity were negatively affected as a result. Restrictions were placed on selling and purchasing of land certificates, which significantly slowed down structural changes and thus productivity growth. Second, owners had little incentive to put in effort and undertake investments because property rights on specific plots were not clearly defined. At the end of the 1990s the situation started to improve when land policies were further liberalized, and limited land transactions became possible. Finally, privatization of farms and agri-food companies led to contracting problems and disruptions all along the agri-food chain. Investments by private processors and the reintroduction of vertically coordinated supply chains have been important in overcoming these hold-up problems and improving output, productivity and quality of agricultural products. Foreign direct investment (FDI) in the agri-food sector played an important role in these developments through spillover effects on farmers and local food companies (Dries and Swinnen, 2004). They have contributed dramatically to productivity and quality improvements and technology transfers. Figure 4 illustrates the vast differences in the inflow of FDI since the mid-1990s. FDI rose strongly in Central Europe and the Baltic states. In the Balkan states, the inflow of FDI lagged behind. However, after substantial reforms were introduced at the end of the 1990s, FDI started to increase there as well. In the European CIS, Transcaucasia and Central Asia, FDI inflow has been very low, and increased only in more recent years. Initial conditions, reform policies and investments had a large impact on agricultural productivity changes throughout the region, but effects varied tremendously among countries and over time. We distinguish four patterns. The first group of countries are the most economically advanced countries in Central Europe and the Baltics, such as Hungary, the Czech Republic, Slovakia and Estonia which implemented radical reforms. These countries were characterized by relatively high incomes, a capital-intensive agricultural sector and a big-bang approach to reforms and privatization, including restitution of land to former owners. The loss from foregone economies of scale was limited because the restitution of agricultural land to previous owners led to consolidation of land in large farming enterprises. In addition, a massive outflow of agricultural labor occurred early in transition, facilitated by a well-developed social safety net system and radical reforms which stabilized the macroeconomic environment. This outflow of labor caused substantial gains in labor productivity early on in transition. Later, productivity gains were reinforced by spillovers from the large inflow of FDI in the agri-food sector. Investments, through vertically integrated supply chains, improved farmers’ access to credit, technology, inputs and output markets. Another pattern was followed by the poorer CEECs, including Romania, Bulgaria, Lithuania and Poland. These countries were diverse in their initial farm structure. Before transition, Poland already had mainly small, family farms, whereas in Lithuania, Romania and Bulgaria the agricultural sector was concentrated in large corporate farms. However, in all of the countries, labor outflow from agriculture was limited in the first years of transition. In these countries, agriculture served as a social buffer in times when overall unemployment was high and social benefits were low. The restitution of land to former owners constrained access to land for young farmers, since that land was given to older people who started farming to complement their small pensions. Because the agricultural sector in these countries was relatively capital-intensive, the break-up of the corporate farms into small, family farms caused significant losses in economies of scale and yielded only limited gains from the shedding of labor. Initially, both output and productivity declined. In countries such as Poland and Lithuania, output and productivity started to recover in the mid-1990s stimulated by FDI. In Romania and Bulgaria output and productivity recovered only slowly, and at the end of the 1990s they decreased again as a result of the financial crisis. From the beginning of the 2000s the outflow of inefficient labor and the inflow of FDI started a sustained recovery. Third, a group of poor Transcaucasian and Central Asian countries, such as Armenia, Azerbaijan, Kyrgyz Republic and Tajikistan, followed yet another pattern. These countries are characterized by their poverty and the absence of a good social safety net system, their labor intensive agricultural systems and their slower progress in overall reforms. In these countries, agriculture also provided a buffer role and a labor sink. Reforms caused a strong shift from large scale towards individual farming—especially when land distribution in kind to households was introduced after the failure of the share distribution system became evident. The reforms also caused a substantial inflow of labor into agriculture, and growth in the importance of more labor-intensive sectors, such as horticulture and livestock. This caused a decrease in labor productivity while land productivity grew. Although there has been substantial growth in yields, labor productivity is still now substantially below prereform levels in Transcaucasia (see Figure 1). A fourth pattern is followed by a group of middle income FSU countries, including Kazakhstan, Russia and Ukraine. In these countries, there was almost no outflow of agricultural labor and, since output fell substantially in the 1990s, agricultural labor productivity declined strongly. Reforms were implemented only slowly and soft budgets continued, which favoured the large-scale farms and constrained restructuring, with limited efficiency gains. Only after the Russian crisis in 1998 did the macroeconomic situation improve with enhanced competitiveness of the domestic agricultural sector through exchange rate devaluations and the inflow of revenues from increasing oil and mineral prices. This affected in particular Russia and Kazakhstan. 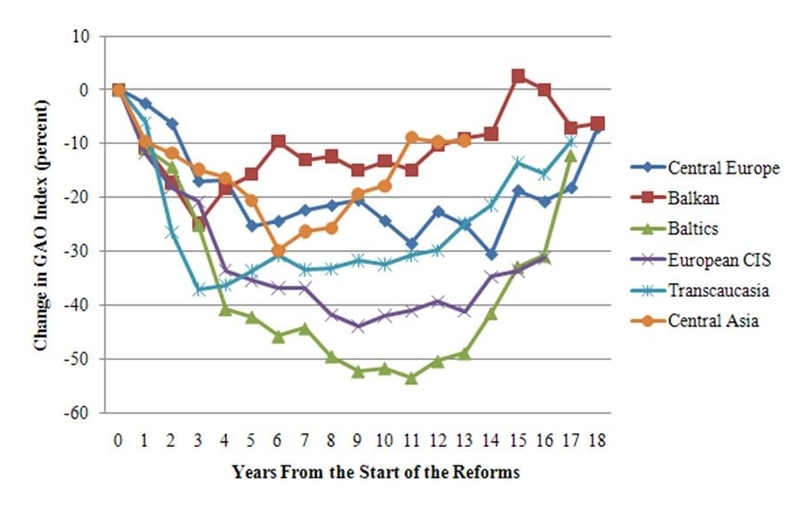 Ukraine implemented a series of important reforms in the late 1990s. Since then, agricultural productivity has increased in these countries as liquidity in the economy and investments in agriculture increased. Surplus employment started to decline gradually. An important factor in the growth of productivity in the 2000s was increased investments in the food industry which benefited agriculture through vertical integration. As Figures 2 and 3 illustrate, it has taken more than 15 years in the European CIS for labor and land productivity to recover to their pre-reform levels. While the recent past has seen positive developments, the future remains uncertain. As documented above, productivity has increased significantly throughout the region in the decade since the Russian crisis in 1998. However, the global financial crisis has hit the CEECs and FSU particularly hard. Due to a combination of factors, some of the countries covered here have experienced declines in output and productivity among the worst in the world (Mitra, Selowsky, and Zalduendo, 2010). Significant declines in demand and reductions in access to finance had important impacts on agriculture (Meyers and Kurbanova, 2009). Governments throughout the region have tried to offset reductions in private finance and investment by the expansion of public support to agriculture. It is unclear at this point to what extent these more recent setbacks or the offsetting policy stimulus will have a lasting effect on the productivity developments in the sector, or whether they will only cause a temporary interruption in a long run path of productivity growth in agriculture. Csaki, C., and A. Fock. (2001). The Agrarian Economies of Central and Eastern Europe and the Commonwealth of Independent States: An Update. Environmentally and Socially Sustainable Development Working Paper, World Bank, Washington, D.C.
Dries, L., and J.F.M. Swinnen. (2004). Foreign Direct Investment, Vertical Integration and Local Suppliers: Evidence from the Polish Dairy Sector. World Development, 32(9), 1525-1544. Lerman, Z., Kislev, Y., Biton, D., and A. Kriss. (2003). Agricultural Output and Productivity in the Former Soviet Republics. Economic Development and Cultural Change, 51, 999-1018. Lerman, Z., Csaki, C., and G. Feder. (2004). Agriculture in Transition: Land Policies and Evolving Farm Structures in Post-Soviet Countries. Lanham: Lexington Books, Lanham. Liefert, W.M. (2008). Measuring the Success of Agricultural Transition: An Application to Russia. In Csaki, C., and C. Forgacs (eds. ), Agricultural Economics and Transition: What was Expected, What We Observed, the Lessons Learned (pp.44-54). Halle, Germany: IAMO. Macours, K., and J.F.M. Swinnen. (2000). Causes of Output Decline during Transition: The Case of Central and Eastern European Agriculture. Journal of Comparative Economics, 28, 172-206. Macours, K., and J.F.M. Swinnen. (2002). Patterns of Agrarian Transition. Economic Development and Cultural Change, 50(2), 265-294. Meyers, W., and G. Kurbanova. (2009). Impact of the Global and Financial Crisis on Food Security in Eastern Europe and Central Asia. Background Paper for the Conference on Social Impacts of the Economic Crisis in Eastern Europe, Turkey and Central Asia, 7-8 December 2009, Almaty, Kazakhstan. Mitra, P., Selowsky, M., and J. Zaluendo. (2010). 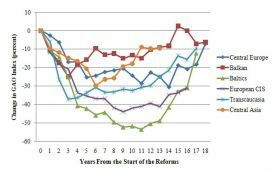 Turmoil at Twenty: Recession, Recovery, and Reform in Central Eastern Europe and the Former Soviet Union. The International Bank for Reconstruction and Development, World Bank. Rozelle, S., and J.F.M. Swinnen. (2004). Success and Failure of Reform: Insights from the Transition of Agriculture. Journal of Economic Literature, 42(2), 404-456. Sedik, D., Trueblood, M., and C. Arnade. (1999). 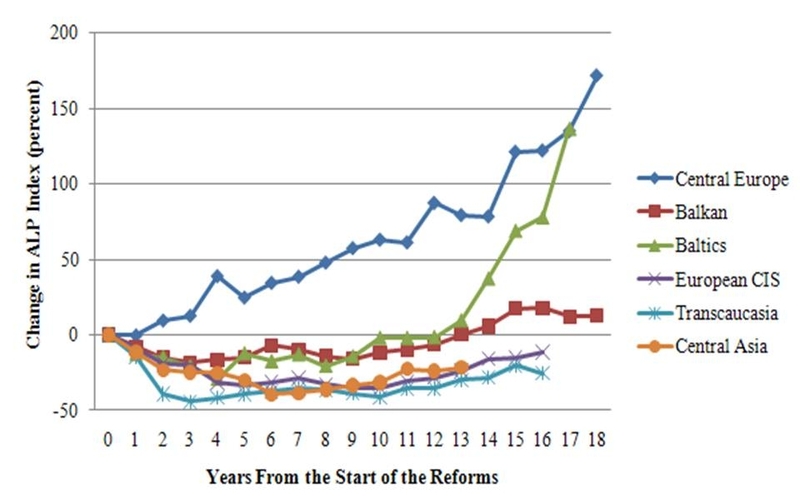 Corporate Farm Performance in Russia, 1991-1995: An Efficiency Analysis. Journal of Comparative Economics, 27, 514-533. Swinnen, J.F.M., Dries, L., and K. Macours. (2005). Transition and Agricultural Labour. Agricultural Economics, 32(1), 15-34. Swinnen, J.F.M. and L. Vranken. (2009). 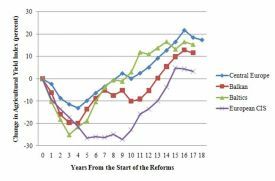 Reforms and Agricultural Productivity in Central and Eastern Europe and the Former Soviet Republics: 1989-2005. Journal of Productivity Analysis, forthcoming. Johan Swinnen (jo.swinnen@econ.kuleuven.be) is Professor of Development Economics at the Department of Economics and Director of LICOS-Centre for Institutions and Economic Performance, Katholieke Universiteit Leuven, Belgium. Kristine Van Herck (kristine.vanherck@econ.kuleuven.be) is a PhD student at LICOS-Centre for Institutions and Economic Performance, Katholieke Universiteit Leuven, Belgium. Liesbet Vranken (liesbet.vranken@hubrussel.be) is Assistant Professor of Economics at the Centre for Corporate Sustainability, HU Brussels, and affiliated researcher at LICOS-Centre for Institutions and Economic Performance, Katholieke Universiteit Leuven, Belgium.